I was due to be born on my Grandpa S’s birthday, but I was born 2 days later on my own dad’s birthday. 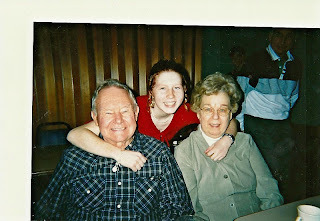 As I was remembering and missing my Grandpa on his birthday, I realized my memories of Grandpa are already growing dim. I said goodbye to him only 5 and 1/2 years ago, and I’m afraid to let any memories of someone who was once so special to me diminish so I’m going to write a post in honor of my memories of him. My earliest memories of Grandpa S consist of taking strolls around his farm with him, and having him introduce me to all the livestock. 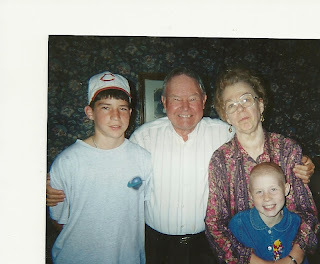 I remember seeing Grandpa out the kitchen window of the farm-house and running outside to be with him. He was standing next to the cow barn with one foot on the ground, one up on a fence post, and his arms hanging over the top of the fence, looking towards the cows. He picked me up so that I was eye-level with the cows. One of the cows turned its head toward Grandpa and stuck its tongue out and, much to my surprise, Grandpa grabbed it and held it there so I could see it was purple! I remember him taking me by the hand and walking into the hog barn and seeing cute little piglets. I remember him leading me around to the field where they used to keep the horses, and showing me where they would ride them. I have a lot of memories with Grandpa on the farm, but mostly what I remember about Grandpa is singing with him. Grandpa and I were always singing together. There are several home videos of this happening. Anyone who knows me knows that I love to sing, and am pretty much always singing, but this is an inherited trait. Inherited from both sides, but I definitely remember singing with Grandpa S. Grandpa’s favorite song was, ‘Old Shep’ written by Red Foley, and made famous by Elvis Presley. My uncles tried to teach it to me to sing to Grandpa at his 70th birthday party, but at 6 years old, I couldn’t quite master it yet. 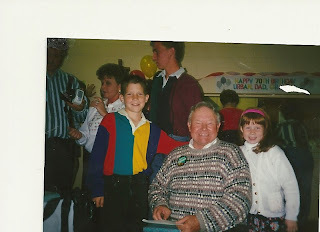 When I was in the hospital for my 2nd brain surgery, Grandpa couldn’t be in the Cincinnati Children’s waiting room when I woke up that day, but he did call me and sing ‘Old Shep’ to me over the phone to comfort me. 5 years later, when I visited Grandpa for the last time, he could barely talk to me so Mom encouraged me to sing ‘Old Shep’ to him to soothe him. It was really hard to make it through.